Juggling scarves are the perfect way to teach children to juggle. A juggling scarf is much lighter than a ball which means that they'll float to the ground much slower than balls, ths gives kids more time to think about the motion that they need to create. 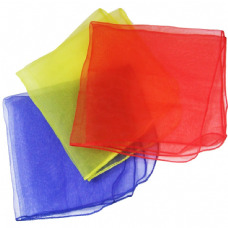 Juggling scarfs are also easy to catch as they offer a brightly coloured wide surface area, they can be grabbed in almost any way as opposed to a ball which needs to be caught. They're not only ideal for teaching anybody to juggle but they're also great fun in their own right. Juggling scarves are ideal for being incorporated into dance routines (we recommend our larger scarves for this) and are also great just for messing about with, our scarves are all certified as safe products so can also provide a great sensory prop for babies.